A Fresnel is a lighting instrument that has a front lens element made of concentric circles that disperse light emissions in a directional manner. Most fresnels are capable of widening and tightening (flood & spot) the light beam as well. Fresnel lights are a widely used design of lighting instrument because of their range of lighting instrument types, and their ability to „flood and spot“ which will wider or tighten the light beam respectively. 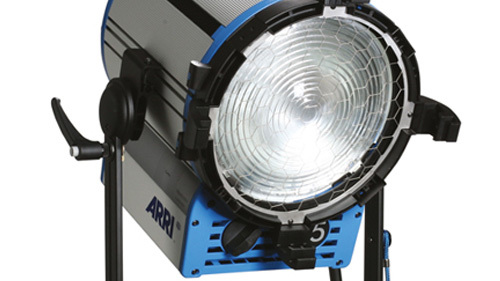 The Fresnel light is available in both color temperature ranges of 32K and 56K base of tungsten and HMI. Some LED models of fresnel lights are bi-color and can range from 32K up to 56K or higher, as well as any color temperature in-between. There are models of moving lights and multicolor LEDs that can provide a full range of RGB color scrolling within a fresnel lamp housing. or even a medium or small instrument because of the size and weight of the lens of glass. Fresnel invented a single lens comprised of concentric circles of partially shaped convex glass curvatures. This design allows for a considerably lighter and smaller lens element that causes the shape of light to be concentrated and behave as if it is passing through a traditional fully convex piece of lens glass.